Our first meal at home! 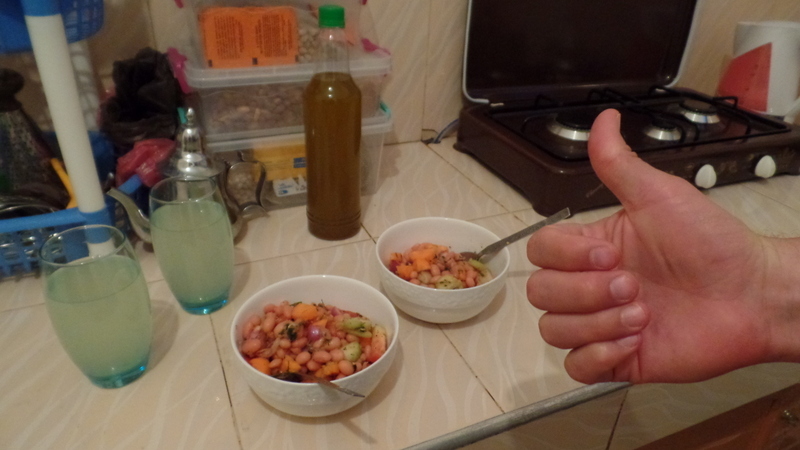 White bean salad with fresh tomatoes, cucumber, carrots and onion. And nary a xubs (bread) to be found! Thomas approves. We have now slept in our new apartment for two days. We are greatly enjoying being in our own space, cooking our own food and learning how to live much more independently in Morocco than the initial 3½ months allowed. The temperature in our town is heating up, with daily highs into the 90s, and I admit it already feels physically taxing at times. Yet when we talk with local folks about the current hot weather the two most common responses are, “the heat’s good for you!” and, “wait until August!” During ‘sHar tmnya’ (month eight as it’s known in Morocco) the temps can reach 120˚ during the day, which makes these late April temps seems positively balmy. I am trying to find good ways to stay cool at night, and hope to get some freezable gel packs to sleep with (a tactic I have used in the past to great success). Thomas and I will be going to Errachidia (a larger town near us) in early May and there is a Wal-Mart type store there called Acima that hopefully will carry them. We are also hoping to find oatmeal at this store, as it is not an easy product to acquire in most towns and we miss having oats around for breakfast as a break from the more standard bread with olive oil. My work activities are also ‘heating up’ as of last week. I am now scheduled to teach three classes a week at the Dar Takafa (House of Culture): conversational English for women, a yoga/aerobics class (also for women), and a Bac (bacheloriate) prep class for high school girls (the Bac is a test that high school students take to get into college—sort of the Moroccan equivalent to the SAT). 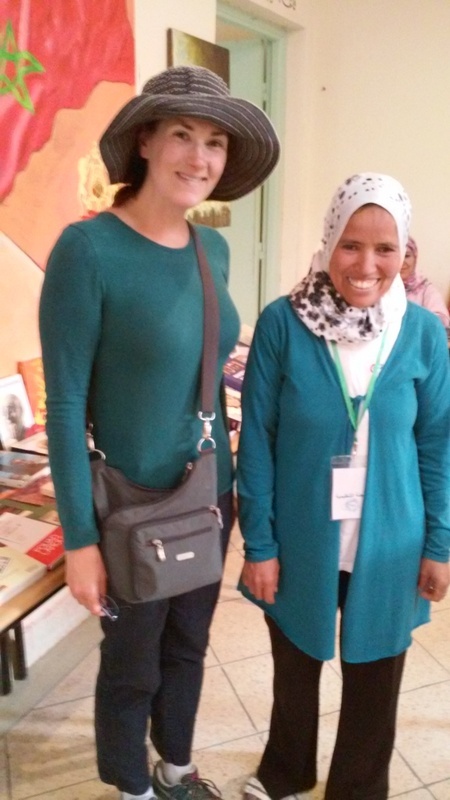 I have also found myself a Darija tutor, the wonderful Hadija! She is such a gem of a lady, and I think she will be a great fit to help me continue learning how to communicate with Moroccans more easily. Hadija is quite active with the Dar Takafa and we have become fast friends. She is such a lovely lady, and I feel fortunate that she agreed to tutor me! In addition to now having these structured weekly activities, Noa, Drea (another PCV in the area), and I have started discussing the possibility of organizing a mid-summer women’s health fair for the community. The idea is to hold the fair during the night (to match local standards that during summer most activities occur at night due to the heat), and incorporate both health testing (hearing tests, blood pressure, foot care, etc…), and provide information sessions about common women’s health issues. We have started asking local folks if this idea seems like a useful one for the community and so far everyone I have talked with seems quite excited by the concept. This weekend’s highlight was finally finding bicycles so that we have a bit more speedy transportation than walking. Because our town is situated along a highway that connects many small towns, being able to bike from place to place will be quite helpful over the coming months. There are often events and festivals in one town that are attended by people from other towns, and we are keen helping with activities that might not be within easy walking distance. So, as we approach the one-month-in-site mark, I am feeling quite pleased with all that has happened so far, and all that will happen in the days, weeks, and months ahead, in’shallah! So glad to here you are settled in. And being able to eat your own food and moderate the amount of bread or other unwanted food is obviously a great freedom. I do hope you can find the gel packs. If not, wet washcloths with ice might do the trick. Or filling plastic bottles with water and freezing them… I forget if you have a freezer! I love hearing about your work and the plans for the women’s gathering sound exciting. Maybe it could be an annual event?